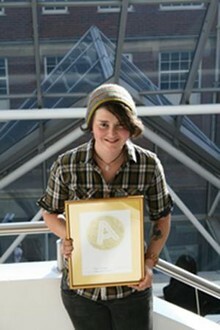 Jess O'Callaghan, who studied for her Digital Media Design BA with City College Brighton and Hove’s Higher Education department, has won a coveted 'A' award in the annual YCN Student Awards in London. Supported by Universities, Colleges and Art & Design Schools across the UK, the awards were established in 2001 to inspire and showcase emerging creative talent and enable high-profile partnering organisations such as 20th Century Fox, Marks & Spencer, SEGA and Ted Baker to engage with the very best emerging creative practitioners in design and advertising by setting them a live creative brief. Jess and the other commended entrants’ work will now be celebrated online and in print, and showcased as part of an industry exhibition. "Jess presented a simple solution encompassing both our historical content and use of new technology through combining 'nostalgic' imagery with augmented reality. Taking the idea through from an online platform to a printed flyer neatly directs the user to visiting the museum." "Jess is a gifted and talented student both technically and creatively and I’ve a firm belief that she'll do very well in the digital media industry", said her former tutor, Sarah Strickett. "Her ‘A’ Award is a testament to how hard work and dedication can pay off." Of her time at City College, Jess said: "It was a brilliant course that really opened up our minds to new ways of doing things in Digital Media and encouraged us to be more experimental. Being at City College definitely helped me to reach a level where I could achieve something like this." About City College Brighton and Hove: Situated in the heart of Brighton and praised as 'Outstanding' by Ofsted in its June 2011 report, City College Brighton and Hove is an international centre of vocational excellence and one of the top performing Further Education Colleges in the country. Every year, 2,000 full-time, 7,000 part time, 400 Higher Education and 400 14-16 year old students as well as many international and European students choose City College as their place of further and higher education training. In addition, the College provides training to over 2,000 businesses via its 'City Business Skills' department which focuses on employer training needs. Offering over 700 courses from basic level right through to business and postgraduate training, City College is working with its partners to develop the workforce of the future.